Thousands of students, parents, families and educators across the Kansas City region walked to school on Wednesday, Oct. 5, 2016, as part of International Walk to School Day sponsored by BikeWalkKC, MARC and KCHealthyKids. A record 91 schools in the Greater Kansas City and Lawrence areas participated this year, up from 66 schools in 2015. BikeWalkKC, MARC and KC Healthy Kids work to support the celebration of International Walk to School Day. This year, record numbers of students parents and families walked to school. 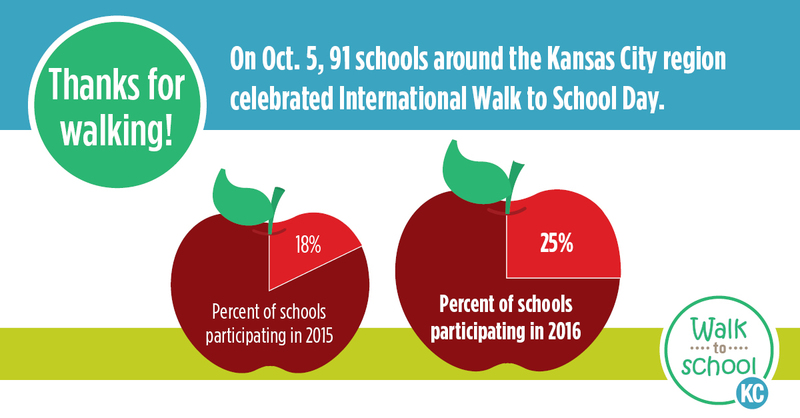 Thousands of students, parents, families and educators across the Kansas City region walked to school on Wednesday, Oct. 5, 2016, as part of International Walk to School Day. A record 91 schools in the Greater Kansas City and Lawrence areas participated this year, up from 66 schools in 2015. Walk to School Day events help highlight the importance of creating safe routes for children to walk and bicycle to schools, along with the positive benefits of walking — creating a sense of community, increasing physical activity and using an active form of transportation. According to the Safe Routes to School National Partnership, private vehicles are often used to transport students to schools, even for distances as short as a quarter mile. Be attentive and keep your eyes on the road. Do not text and drive. Obey posted speed limits, including reduced speeds near schools. Yield to children crossing the street and crosswalks. More information about walking to school is available online at BikeWalkKC’s Walk to School site, http://www.walktoschoolkc.com ; MARC’s Safe Routes to School web page, marc.org/srts; and the International Walk to School Day website, http://www.walkbiketoschool.org. Gardner: Grand Star Elementary School; Moonlight Elementary School; Sunflower Elementary School. Grandview: Belvidere Elementary School; Butcher-Green Elementary School; Conn-West Elementary School. Independence : William Yates Elementary School. Kansas City, Kansas: Frank Rushton Elementary School; Grant Elementary School; Hazel Grove Elementary School; Welborn Elementary School; Midland Trail Elementary School; W.A. White Elementary School; Whittier Elementary School; Frances Willard Elementary School. Kansas City, Missouri: Martin City Elementary School; Hale Cook Elementary School; Maplewood Elementary School; Maple Park Middle School; Quality Hill Academy; Kipp Endeavor Academy; Border Star Montessori Elementary School; Citizens of the World Charter School; St. Elizabeth School; St. Peter’s School; Academy Lafayette; Ravenwood Elementary School; Whittier Elementary School; Garfield Elementary School; James Elementary School; Wheatley Elementary School; Briarcliff Elementary School. Lawrence: Kennedy Elementary School; Langston Hughes Elementary School; New York Elementary School; Sunset Hill Elementary School; Quail Run Elementary School; Sunflower Elementary School; Deerfield Elementary School; Hillcrest Elementary School; Schwegler Elementary School; Cordley Elementary School; Prairie Park Elementary School; Southwest Middle School; Woodlawn Elementary School; Liberty Memorial Central Middle School; Broken Arrow Elementary School; South Middle School. Leawood: Mission Trail Elementary School; Brookwood Elementary School. Lee's Summit: Chapel Lakes Elementary School; Voy Spears Jr. Elementary School; Lee's Summit Elementary School; Longview Farm Elementary School; Meadow Lane Elementary School. Lenexa: Mill Creek Elementary School; Sunflower Elementary School. Lone Jack: Lone Jack Elementary School. Olathe: Black Bob Elementary School; Green Springs Elementary School; Ravenwood Elementary School; Meadow Lane Elementary School; Liberty View Elementary School. Overland Park: Oak Hill Elementary School; Bentwood Elementary School; Santa Fe Trail Elementary School; Trailwood Elementary School; East Antioch Elementary School. Prairie Village: Belinder Elementary School; Corinth Elementary School. Raytown: Southwood Elementary School; South Middle School. Roeland Park: Roseland Elementary School; St. Agnes Catholic School. Shawnee: Belmont Elementary School; Bluejacket-Flint Elementary School; Clear Creek Elementary School. Westwood: Westwood View Elementary School.